Eoin Finn used to be tight. Not in a money-hording way, but the kind of tight a body gets as it cries out for mercy after days of grueling windsurfing. Or being thrown off cliffs. Or hurtling down the side of a mountain. In the days before a dude witnesses a stiff friend who has to lie down just to put on his socks. You know, the days before a guy would consider seriously taking up yoga. Finn’s a fairly typical West Coast dude. He surfs, camps in his car, and exercises naked at home to avoid creating extra laundry. And 15 years ago when he began practicing yoga it was more as an afterthought—an effective warm up before he embarked on whatever extreme sport venture was next on his list. Since completing a two-year yoga apprenticeship in Hawaii, he’s lived in B.C. teaching and developing a loyal clientele. “No one sucked harder at yoga than me when I started, but it’s worth it. Not doing yoga was like walking around all day confined in a five millimetre wetsuit,” explains Finn, now the best-known yoga instructor in Vancouver. You could say he’s a bit of a go-getter. “I mentioned the idea of having a Mexico surf and yoga retreat to a guy once and he was like, ‘You can’t do that.’ So I did,” recalls Finn (who heads surf and yoga retreats in Baja) in a way that only a blissed-out yoga guru could without sounding like he was bragging. He’s also behind the web site vancouveryoga.com, and has made a highly successful line of instructional DVDs. His latest venture? Finding time in his frenetic teaching, seminar and traveling schedule to instruct regular yoga classes in Tofino. “ I’ve sat on many mountaintops in the lotus position contemplating the best life possible, and this is it,” says Finn. He’s referring to his new itinerary: Fly to Tofino every Wednesday afternoon, go surfing, teach a yoga class, car camp (in the trusty Suburban he leaves on the coast), then get in as much surfing as possible before flying back to Vancouver Friday morning to teach a class that night. For Finn, the connection between yoga and surfing is clear. Surfing is about experiencing the moment and focusing your attention. You excel when you concentrate on one thing instead of letting your mind oscillate between thoughts—exactly like practicing yoga. But even if surfers make the correlation, he’s not sure they’re buying it—especially men. Well, at least it’s not the purple unitard or anorexic hippie stereotypes scaring them off. But seriously, Finn makes a point. To surf well you’ve got to be loose, relaxed and fluid in situations that are demanding—physically and mentally—and dynamic. Exactly what the poses in Finn’s yoga classes aim to teach. Finn practices an Ashtanga-based form of the discipline known as Power Yoga. Developed in India in the early 1900s, it mixes gymnastics with yoga and, unlike Bikram’s which breaks between poses, involves continuous movement done in a relaxed mindset where you don’t actually stop until you’re done. Sounds like something people on the coast can—and do—definitely dig. I mention to Finn that long-time local surfer Catherine Bruhwiler once told me that if she keeps doing yoga she’d be able to surf forever. 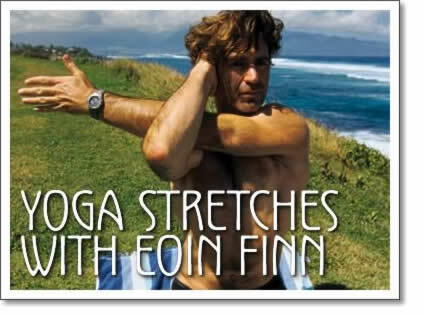 Tofino yoga instructor Eoin Finn is profiled in this yoga article by Kate MacLennan for Tofino Time magazine.